GroomingLounge.com Experts Point to a Surprise GOP Nominee, Speaker Paul Ryan's eyebrows tell the story. “We are uniquely qualified to comment on how grooming can affect public perception” says Grooming Lounge CEO Mike Gilman, “We’ve worked with our fair share of men that know how to win campaigns." As Republicans consider both the substance and style of the candidates they are trying to envision as our next President -- GroomingLounge.com, the nation’s premier grooming resource, has some insights on who will emerge as the nominee from the June GOP Convention. 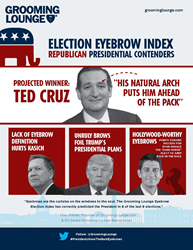 As evidenced by Grooming Lounge’s now-iconic “Election Eyebrow Index,” which has correctly predicted the winning President in 8 out of last 9 elections*, well-groomed eyebrows (a.k.a. the curtains on the windows to the soul) can greatly affect public perception. Of the remaining Republican candidates: Donald Trump, Ted Cruz and John Kasich, Cruz has the best-groomed eyebrows in the bunch -- so based on our historical findings -- with the current candidate landscape, he will emerge the likely candidate. Donald Trump’s overgrown eyebrows are as unruly as some claim his behavior is and could use a trim. John Kasich’s seem to start at his pupils and continue without definition to below his smile lines. Ted Cruz’s eyebrows are not perfect, but they have a natural arch that comes to the end of the eye and no obvious stragglers poke out. That said, rumors of a dark horse candidate are floating through DC circles. Based on his impeccably groomed eyebrows, Grooming Lounge experts believe there may be some credibility to the rumor that Senate Majority Leader Paul Ryan may emerge as the 2nd, 3rd, or 4th ballot winner in a contested convention. *The only exception to the Election Eyebrow Index’s accuracy was Bush V. Gore, in which the Index pointed to Gore as the winner. While he did not win the Presidency, he did win the popular vote. Grooming Lounge is the country’s premier destination for upscale men’s grooming products, services and advice. Open 24/7 worldwide at http://www.groominglounge.com, the company also has iconic Barbershop & Spa locations exclusively for men in Washington, DC and Northern, VA, franchise opportunities open nationwide and its own line of custom-formulated Men’s Grooming Solutions.